The Devil Dog Duathlon is one of the best in the business! It’s a 5K run/30K bike/5K run – or you can register for just a 5K. COURSES: Your first 5K will be on a mostly flat course that loops through the 43 Area. 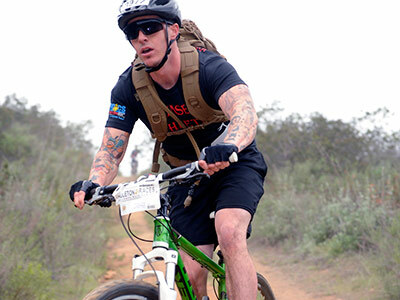 The 30K bike course takes you out and back through scenic Camp Pendleton. The last leg will be another 5K through the 43 Area. This course is fully supported with water points and aid stations. Chip timing with split times for each leg of the race. THE BIKE PORTION IS NOT A CLOSED COURSE. YOU WILL BE SHARING THE ROAD WITH CARS – PLEASE RIDE SAFELY. 5K Run: You’ll be starting with the Duathletes on the same 5K course – mostly flat, pavement and hard-packed gravel fire roads. SCHEDULE: Race starts at 8:30 am – mass start. Day of race registration and chip pick-up (duathlon)and the transition area open at 6:30 am. Transition area closes for all duathlon participants at 8:15 am. T-shirt pickup will be after the event. ENTRY FEES: DUATHLON CIVILIANS: $45 (individual) and $75 (2-person relay) on or before April 6th, $55 (individual) and $85 (relay) after April 6th or on race day. ACTIVE-DUTY MILITARY (not stationed at Camp Pendleton): $35 (individual), and $60 (relay). 5K RUN CIVILIANS: $25 on or before April 6th, $30 after April 6th or on race day. ACTIVE-DUTY MILITARY (not stationed at Camp Pendleton): $20. MAKE CHECKS PAYABLE TO: MCCS Fund 0140. Entry fees are non-refundable and non-transferable. DEADLINES: Mail-in deadline- April 6th, online registration deadline- April 11th. Register by April 6th to receive your race number and confirmation by mail, free of charge. Note: if you live aboard Camp Pendleton or out of state, race numbers will not be mailed out – you may pick up your numbers on race morning. Click here for the 5K Run entry form. FREE to active-duty stationed at Camp Pendleton – click here for details about how to register in person at the MCCS office. RULES: Helmets are required and USAT rules will apply for the duathlon – no drafting. Minimum age for participating is 13 years old. We’re sorry, but headphones and ear buds are prohibited during the event (base rules). Events are held rain or shine. Entries are non-refundable and non-transferable. Liability waiver must be signed by all participants on race morning. Please note: there is a 2 hour 45 minute time limit on the completion of the duathlon course. TRANSITION AREA: The transition area is first come first served for the duathlon– no assigned racking. Transition area opens at 6:30 am. There is no riding in the transition area or over the transponder mats. DIRECTIONS: From I-5, exit Las Pulgas and follow “RACE EVENT” signs to the race site. Bring a valid driver’s license, proof of insurance, and vehicle registration. Allow 30 minutes from the base gate to the race site. When aboard the base, please follow all posted speed limits. CATEGORIES: Military and Civilian Divisions offer categories for Age Group, Clydesdale (male 200 lbs.+), Athena (female 160 lbs.+), Mountain Bike (no age group), and Challenged Athlete. There is also a 2-person relay division for the duathlon. Age groups are 13-19, (18-24 military), 20-24, 25-29, 30-34, 35-39, 40-44, 45-49, (50+ military), 50-54, 55-59, 60-64, 65-69, 70-74, 75-79 and 80+ for both the duathlon and 5K Run. RESULTS, AWARDS, POINTS & PHOTOS: 11:00 am awards ceremony for the top 3 overall males and females. Awards pickup for age group winners will take place throughout the morning. Awards given to the top 3 overall finishers as well as to the top 3 in each division for the 5K and duathlon. Points for the 2012 MARSOC Hard Corps® Race Series awarded to the top 10 overall males and females in both military and civilian categories. For Camp Pendleton active-duty, points go towards the Pendleton Cup. Results also posted at 3:00 pm on race day; photos posted the week following the event at www.brightroom.com. Visit our friends at WashCoach.org – a site dedicated to the great coaches from the state of Washington. We are big sports fans and would like to thank the fantasy sports site, Draft Duel.org, for supporting us. We would also like to thank our friends at Americas Cardroom. If you sign up, be sure to read about the Americas Card Room promo code. Is Americas Cardroom legit? Find out at Legit or Scam.